On Mount Si’s rugged summit, cloudscape meets rockscape. Mount Si Trail, May 08, 2010. East of Seattle’s greater metropolitan area, Mount Si rises as the first of many Cascade peaks to come. Its trail climbs steadily and steeply through deep woodland shade until it reaches the rocky, often windswept summit with views stretching down the Snoqualmie River Valley to the skyscrapers of Bellevue and Seattle, Washington, the glimmering waters of Puget Sound, and the snow-tipped peaks of the Olympic Mountains beyond. For many locals, Mount Si is the standard comparator for other hikes and, given its rigorous elevation gain (3,150 feet/960 meters in 4.00 miles/6.40 km), is used by many to build endurance while training to ascend higher peaks. 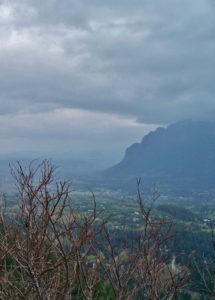 In addition, this craggy alpine summit’s close proximity to urban areas (only 32.00 miles/51.00 km from Seattle, Washington) renders Mount Si a popular hiking destination. Come early and be prepared to appreciate the company of others or try hiking this local favorite on a less-crowded weekday. On the mountain’s verge, lowland forest steeps the trail in verdure. From the picnic area at the trailhead, the very short Creekside Loop (also known as the Francis North Loop), although not an ADA-accessible trail, provides a level, barrier-free path beneath arching, moss-laden branches of bigleaf maple (Acer macophyllum) just off the main trail. Mount Si Trail, May 24, 2014. As the main trail wends upward, the wayside forest quickly becomes evergreen, its unbranched columns supporting a lofty canopy that permits the growth of a lush under- and middlestory of sword ferns (Polystichum munitum), western hemlock saplings (Tsuga heterophylla), and arching vine maple (Acer circinatum). Mount Si Trail, June 30, 2012 and May 24, 2014. In the lowland woodland, keep watch for trailside curiosities, such as pockmarked snags, riddled by both termites and the woodpeckers that relish them (left); luscious-looking, though tasteless salmonberries (Rubus spectabilis) (upper center); elegantly simple blooms of their dewberry cousins (R. ursinus) (right); and herb-Roberts, or, stinky Bobs (Geranium robertianum), pleasant-faced enough but nevertheless rudely named for their foul odor when crushed (lower center). Mount Si Trail, April 18, 2015 and May 24, 2014. Approximately 0.70 miles/1.10 km from the trailhead, the Mount Si Trail arrives at its first junction with the Talus Loop, a side trail that detours 1.30 miles/2.10 km through similar forest on Mount Si’s eastern flank before rejoining the main trail approximately 2.50 miles/4.10 km from the main trailhead. (Both the lower and upper Roaring Creek trails branch east from the loop trail to join the Teneriffe Road Trail, which provides an alternate, although less scenic route to Mount Si’s summit and Mount Teneriffe beyond by an old logging road. On some maps, the Upper Roaring Creek Trail is misnamed as “Talus Loop Trail.” However, the trails themselves are clearly marked.) In addition to shaving approximately a half mile/0.80 km off the total distance to the summit, the little-used loop trail also affords a bit of solitude away from the busy main trail. The Talus Loop is named for the stone-strewn slope near the upper junction, which gazes over North Bend, Washington and beyond to Mailbox Peak, McClellan Butte, and Mount Washington. Talus Loop, Mount Si Trail, November 22, 2015. Just after its upper junction with the Talus Loop, the main trail reaches Snag Flat, where, in 1910, an entrenched forest fire smoldered for weeks. The conflagration’s damage is still evident in the dead trees standing and, mostly, strewn across this relatively level section of the forest floor (hence the name) and in the charred bark blackening the survivors. Beyond Snag Flat, the lush forest gives way to the stunted, less diverse woodland of higher elevation. Mount Si Trail, May 24, 2014. Near the rocky treeline just below Mount Si’s summit, sky light begins to break though the stunted forest. Mount Si Trail, May 24, 2014. Views from Mount Si’s summit begin as soon as the trail clears the treeline. First to greet the sight are the neighboring Cascade Mountains stretching southeast beyond the Middle and South Fork Snoqualmie River valleys. North Bend, Washington lies directly below. Mount Si Trail, May 08, 2010. Mt. Rainier tops the horizon in the southerly view from Mount Si. Mount Si Trail, April 18, 2015. Beneath the clouds, Mount Si’s sweeping westward view encompasses North Bend, Lake Sammamish, Lake Washington, Bellevue, Seattle, Puget Sound, and the Olympic Mountains. Mount Si Trail, May 24, 2014. Mount Si’s rugged summit is crowned by a stone promontory, or “haystack.” Hikers without climbing experience and gear are advised not to attempt it. Instead, enjoy the sufficiently panoramic views from the safety below the haystack and poke about for the wildflowers and other life that cling to the rocks. Mount Si Trail, May 08, 2010. A few blooms brave Mount Si’s stony, windswept summit. In spring, look for tiny blossoms of vine maple (Acer circinatum) (left) dangling from the mountaintop thickets. In summer, spreading phlox (Phlox diffusa) (upper right) softens the scattered stones, while beargrass (Xerophyllum tenax) blooms (lower right) appear to burst like sparklers. 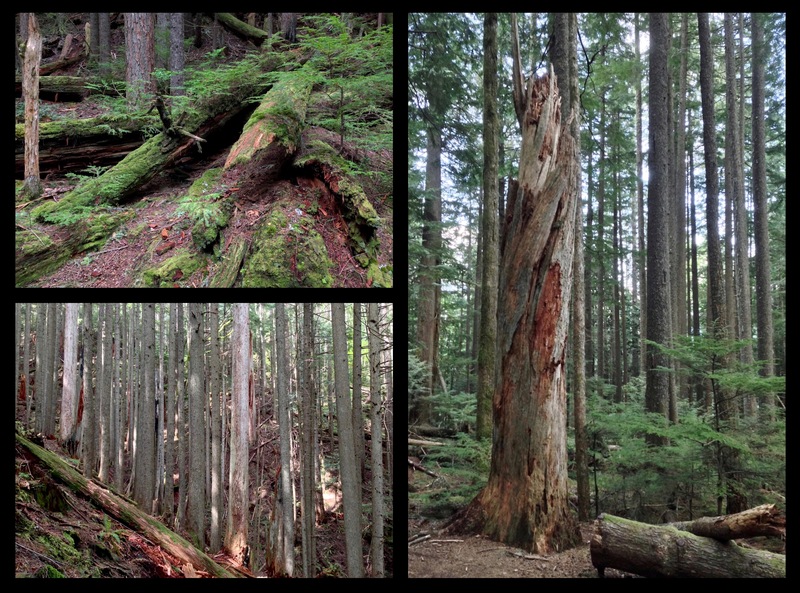 Mount Si Trail, May 24, 2014 and June 30, 2012. 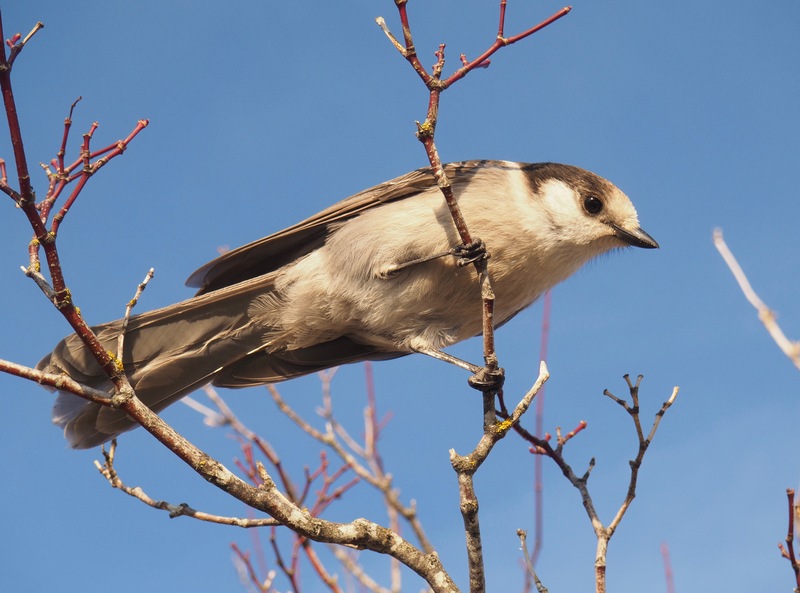 Gray jays (Perisoreus canadensis) frequent Mount Si’s summit, looking for hand-outs or boldly snatching them from unsuspecting hikers. The jays cache the food in crevices of trees for later consumption. Mount Si Trail, December 10, 2017. In an ominous view from Rattlesnake Ledge, Mount Si meets a lowering sky. April 24, 2009. To the Native American Snoqualmie (“people of the moon”), Mount Si is the body of the moon god Snoqualm, who was the keeper of fire and fire-making tools. Known for their resourcefulness and stealth, Fox (or, in some versions of the myth, Beaver) and Blue Jay stole the fire and tools. On their way back down to Earth, they inadvertently spilled the fire in the sky, which continues to burn as the Sun. They gave the fire-making tools to humankind. Snoqualm perished in a fall to Earth while attempting to retrieve his property and his visage is still said to be visible in profile near the summit. Mount Si’s English name derives from that of a local European settler, Josiah “Uncle Si” Merritt. The mountain also served as the backdrop for the 1990s television series Twin Peaks.